Late in the afternoon, toward the end of March, the Azamara Quest pulled out of Miami Harbor heading for Key West, Florida, and then on to Cuba. The air was hot and humid. My husband and I went out on our balcony to watch the land pull slowly away as we sailed out of the harbor. We could hear the music playing from the upper deck. Key West is located on the southern tip of Florida. It divides the Atlantic Ocean from the Gulf of Mexico. It is known for many things but the one I found most interesting is that Ernest Hemingway lived there for almost eight years from 1931 until 1939. But he kept the house until he died. I often wonder if he was sorry he didn’t stay or expected and hoped to go back some day? The time that Ernest spent in Key West was one of his most prolific periods for writing. During that eight year period, he worked on Death in the Afternoon, Green Hills of Africa, To Have and Have Not, For Whom the Bell Tolls and some of his short stories. The Snows of Kilimanjaro was written during this time. Why am I talking so much about Ernest Hemingway? Because that was why I was looking forward so much to our one day stop in Key West. I’d arranged for us to take a tour in the morning after breakfast and then we’d spend time walking around on our own. 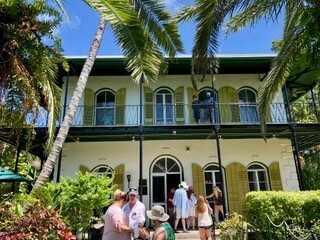 Once the tour was over, the first place we headed for was 907 Whitehead Street and this is what we found: Ernest Hemingway’s home. Claire, your trip to Ernest Hemingway’s home is one I wish to take some day. Thanks for sharing.